If you are learning how to make apple snacks, they can be as simple as picking them from a tree and enjoying the fresh juicy flavor. The high fiber content of this fruit makes them a very good snack food. They are very filling and yet are low in calories. With the luxury of having them available year round, these are a great snack which helps to maintain a good blood sugar balance. A perfect eating apple for an instant apple snack is thought to have a good blend of sweetness, tartness and crunchiness. I am really picky about my apples! Some which are recommended for eating I do not like. 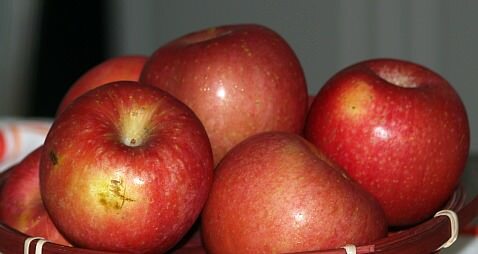 Some that I do like (the Red Delicious for one) are not always good; quite often they are mushy and lacking flavor. The best time to enjoy great apple flavor is during the harvest time. Freshly picked apples offer a better flavor and texture. Long storage of apples will make them dryer and less tasty. This applies more for some apples than others; this is why not all apples are stored through the winter. When learning how to make apple snacks many of the delicious apple recipes which are baked like the breads and coffee cakes fit this bill. These are also great for serving for breakfast or serving along with a meal. These recipes are usually made with pie apples as are most of the desserts. Here I want to focus on some of my children’s favorite apple snack recipes when they were little. I could not wait to learn how to make candy apples; especially how to make caramel apples. I always loved them when I was young but never made them myself; I was eager to make them for my kids. I always loved a rosette recipe ever since I linked the taste to what were called “waffles” at our county fair when I was young. They are so delicious! I really learned to make these for myself! 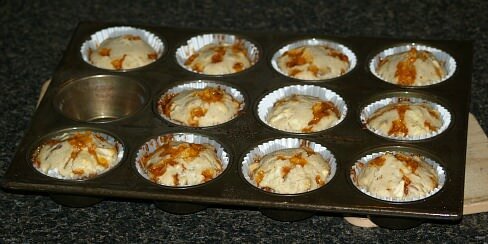 I started with the plain ones but the apple cinnamon recipe is a great apple snack recipe. There is one problem; there is never enough because they are so good. 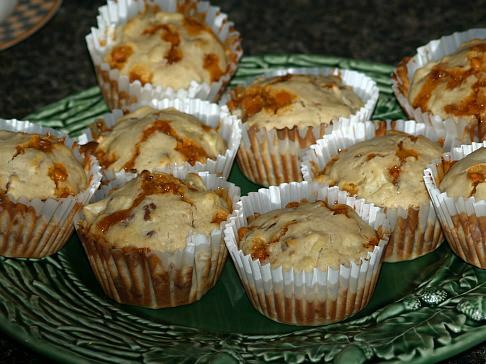 This muffin recipe makes great apple snacks. Combine and sift flour, sugar, salt and baking powder. Add all at once eggs, milk, oil, morsels, apples and nuts; stir only until dry ingredients are moistened. 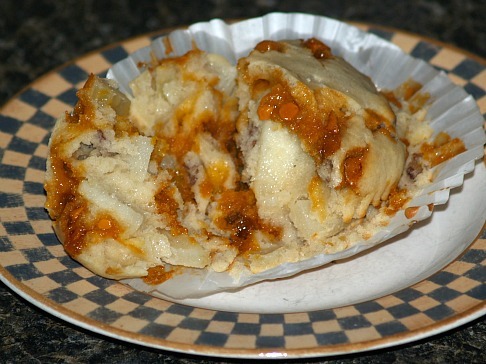 Fill muffin cups 2/3 full; ½ cup batter for jumbo or ¼ cup batter for regular size. Bake until golden brown; 15 to 25 minutes depending on size. Butter cookie sheet generously; wash and dry apples thoroughly. Insert ice cream stick in stem end of each apple. Mix sugar, water, corn syrup and food coloring in a heavy saucepan. Heat to boiling over high heat; reduce temperature. Boil gently without stirring until candy thermometer reaches 290F degrees. NOTE: If no thermometer is available drop small amount of mixture into very cold water; should form hard ball but not brittle. Quickly dip apples into syrup twirling until apple is completely coated. Stand on buttered cookie sheet; let cool. This apple snack recipe is made easy by using a bag of caramels. I have often made homemade caramel recipe and dipped the apples in it. I have also dipped them only in caramel and without the peanut butter and without the cinnamon. You can also spoon granola or coated candy onto the apples instead of the peanuts. (I prefer the peanuts). Wash and thoroughly dry the apples; insert ice cream sticks in the stem end of each apple. Heat caramels, water, peanut butter and cinnamon in top of double boiler over hot water. Stir frequently for about 20 minutes until caramels are melted and mixture is smooth. Keeping top over the hot water remove all from the heat. Dip apples in hot caramel mixture spoon mixture over apples until completely coated. Dip tops in chopped peanuts and refrigerate until caramel is firm. In small bowl combine and mix flour, sugar, salt, cinnamon and nutmeg. Add apple juice, egg and 1 tablespoon oil; whisk until smooth. Heat 3 to 4 inches oil in a heavy pan or deep fryer to 365F degrees. Place rosette iron in hot oil for about 30 to 60 seconds or until hot. Gently dip rosette iron into batter not ALLOWING BATTER TO RUN OVER THE TOP OF IRON. Return iron to the hot oil immersing completely in the hot oil until rosette is crisp and light brown. Remove from oil; gently slip rosette off iron and onto paper towels. NOTE: It may take a while to get this down but don’t give up; it is worth the effort. These are so delicious. This is a great refreshing apple snack for fall when the temperatures are still hot. Pour apple juice and lemon juice into a smoothie or blender container. Add sugar, cinnamon and peeled apple slices; add shaved ice. Process mixture until smooth and blended; garnish with unpeeled apple slices.